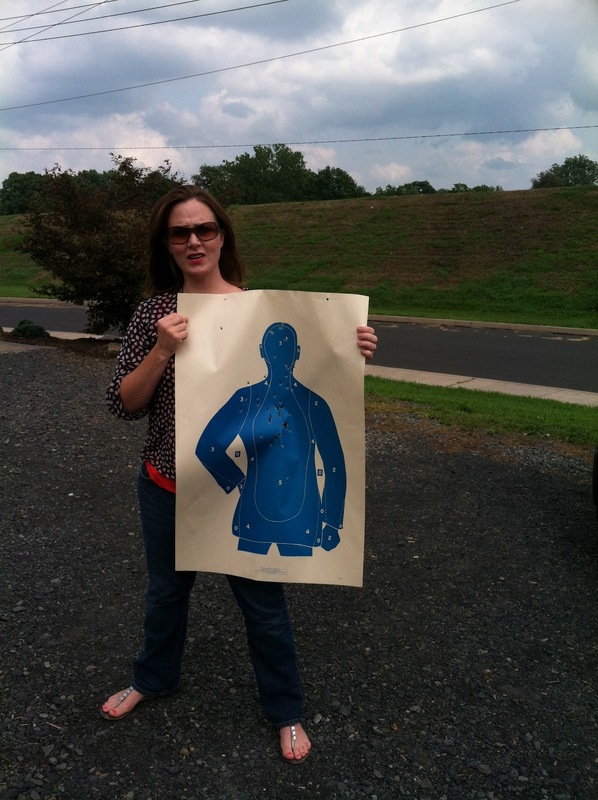 My husband has been dying to take me to the pistol range where he is a member. He wanted to teach me how to properly shoot a gun just in case we have an intruder while he is out of town, or worse, some parent cuts line in carpool. So, I finally got a sitter and went. Once we arrived, I took a fifteen minute safety course, then signed a paper saying that I wouldn't sue them in case I was injured or shot or something like that. (I never read the fine print.) They said we could not shoot if we were impaired by drugs or alcohol. They did not mention sleep deprivation as an impairment. Peanut wakes me up at 5:30 every morning. Believe me. That is an impairment. 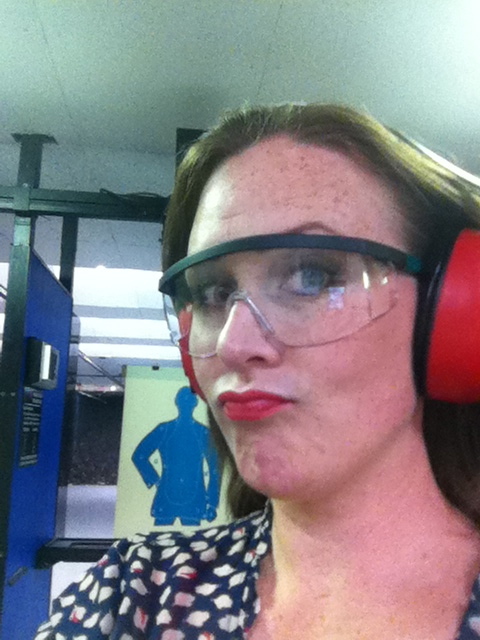 Before entering the range, I had to put on goggles and ear protection that was supposed to make me look ridiculous safe. 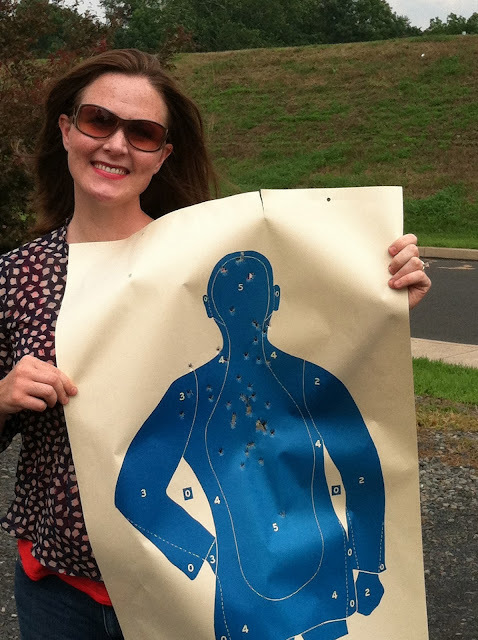 Were they really about to hand this gal a loaded gun? 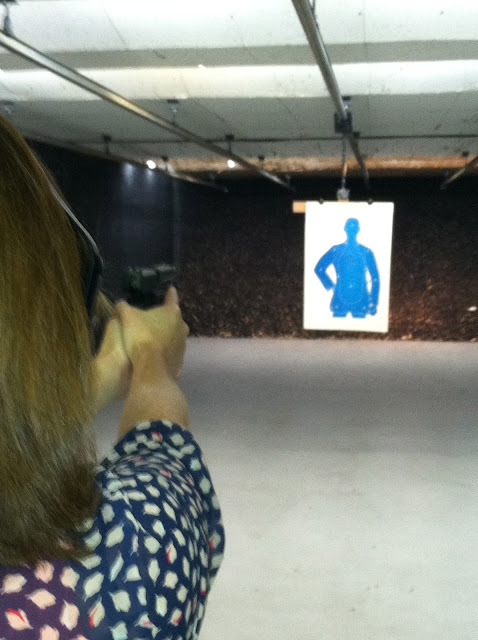 My husband helped me grip my 9mm Sig P226 (impressed?) and before you knew it, I was a shootin' fool. I must say it was quite loud in the range, and the ear protection didn't do diddly for me, but, that didn't stop me from poppin' caps and goin' all gangsta'! Look at that grip! Yowza! I look so for real, don't I? PS. Be sure to go register for my Jewelry Birthday Give-Away! I am IMPRESSED! You know O is always harping on me about that...So now you just got make sure you are packing heat at school pick up! That will show those New Jersians! You know it girl! Ask Omar if my score qualifies me for Ranger training... :) And I STILL want to hear his impression of Lance finding me in the woods! It's good YOUR husband showed you where to keep your thumb; that it needed to be tucked out of the way of the slide. Don't ask me who didn't warn me about that. Nope. Didn't hurt at all. Nope. Didn't bleed when I ripped a hole in my thumb. Didn't even look like someone had been murdered at that outdoor range where we were shooting. And no (in all seriousness) the two people who were with me did NOT stop shooting before they were ready. I had a paper towel (from the half-unwrapped roll in the trunk of the car, of course) wrapped around it. I was fine! And of course we were at the in-laws' house . . . so my MIL had to nurse me back to health and wash my clothes so the blood wouldn't stain them forever. Funny you should mention that.... My husband did NOT tell me that. I took one shot and the guy that worked the range RAN over to tell me to move my thumb or I would get cut badly. I was like, "Gee, thanks honey," could have warned me... He forgot to show me how to grip it before I picked up the loaded gun and once someone has a loaded gun, you can't touch their hands... STILL! He could have TOLD me to move it verbally! HA!!!! that paper man...... heee deaaaaad. My favorite blog post so far! Hilarious. Poor paper man never had a chance. Poor carpoolers better stay in line! HA! It was fun to write! I felt so empowered. Jersey folks, watch out!